Welcome, to a recently promised addition to Fayette/Westmoreland Forgotten History with 'Histbuffer' at your service! 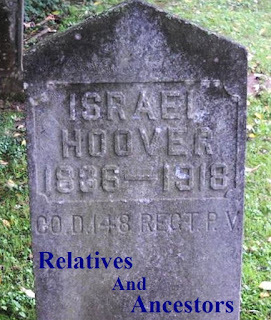 Above is a photo of Israel Hoover's Bakersville, Somerset County headstone. I and my brothers were proud to get over that way back in June of 2014 to make this discovery and show proper honor to someone we believe was a great man in many respects. We also got to see the graves of other ancestors too and add some decorations before we reluctantly headed off. The story on Israel Hoover is a bit sketchy at best, although he certainly was my great grandfather. He was born, by most accounts in Somerset County and lived at Rockwood and Brothers Valley on the old Forge Road near what is known as Spook Hollow and Spook Run, toward the east. Israel fought through much of the Civil War and was said to of seen action at Gettysburg. This was the man that made such a startling impression that a strong family tradition relates his statements, one of which I recounted per word on a separate, older post about his experiences on the battlefield, supposedly at Gettysburg. This derives partly from my post "Excursion to Somerset." but is really best mentioned from January of 2015 beneath the Hoovers subheading, the third paragraph, for "Relatives and Ancestors Chapter Two." The faithful convictions engendered with the sometimes intense reading this small tome probably received! Intently turning pages with such careful and earnest meditation under the hand of a young man in his prime who spent all but a small period out in the fields of batle during these events of great turmoil and anguish, surely wondering just what the future of his beloved country was coming to and whether he would live or die. These thoughts, and others, enter my mind while handling this old treasured book kept by my grandparents as a priceless relic for so long. The pictures are a bit blurry showing the heavily worn quality of the frontispiece. Unfortunately it appears that he possibly ended his days at a poor house.There were documented reports he had a few confrontations with those representing the railroad through his lands and had an occasional habit of scaring them off, gun in hand, apparently shooting over their heads! He was an old veteran you know, so maybe a person can be a bit forgiving of his staunch feelings, whatever the facts behind his hasty attitude. Above the ledger lists things as varied as mackerel, one can of peaches, nails and baking powder. There are items here and there that I have trouble reading the form of writing. Are others in agreement with me in this? Stocking up on some clothing, as with socks, a kerchief and a shirt and two kinds of shoes. Page 16 and I'm wondering, twenty-eight pounds of what? Among other items, ten yards of flannel, two and a half gallons oil and an essential for correspondence, writing paper. Tobacco had its obvious use in those times. Candy was likely considered a luxury as well as the ginger snaps, but then this did only add up to a whopping ten cents. One could only speculate on the use of gingham. Tablecloths, men's shirts, or fabric for a woman's dress are a few ideas that come to mind. Two pounds of coffee for fifty cents seems a good deal! There's also a quarter pound of barley flour and what appears to be some type of strings. Finally, Israel would most likely be relieved to be paid up on his account. Good for him and bless his soul. I hope fans of my blog, as well as internet drifters searching for a few smidgens of minor historical material, have found this an entertaining glimpse into the examination of a Civil war Bible, while including the basic description of items from an 1890's era grocery book.